I eat all of the mistakes. no messy pans or smoky ovens. shoe treat is in this Oreo Tutorial post. so I won't forget and know where to find this. Posterboard -- you can get 15 feet per posterboard. 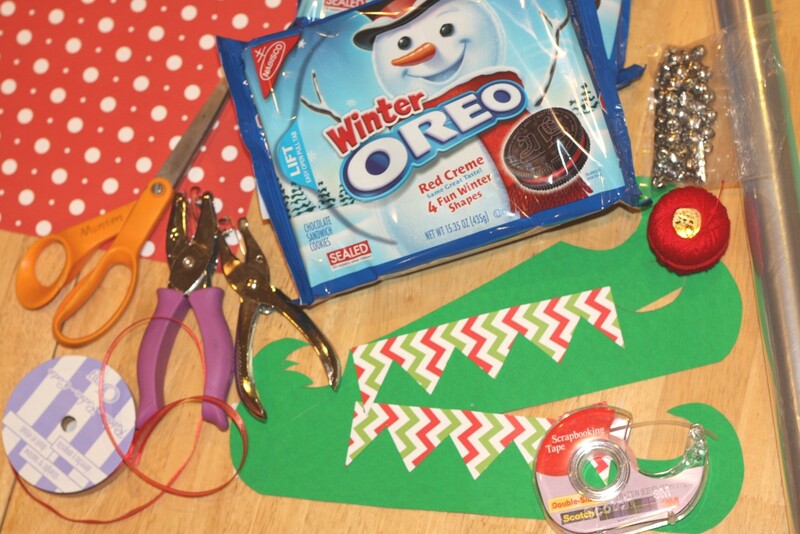 There are about 34 Oreos in these Winter packages. that couldn't be ANY cuter!! I think I'll be giving some out this year as well. Thanks for the idea! THANKS! THESE ARE VERY CUTE! These are so sweet...great idea! Totally cute, will have to pin. Great idea! 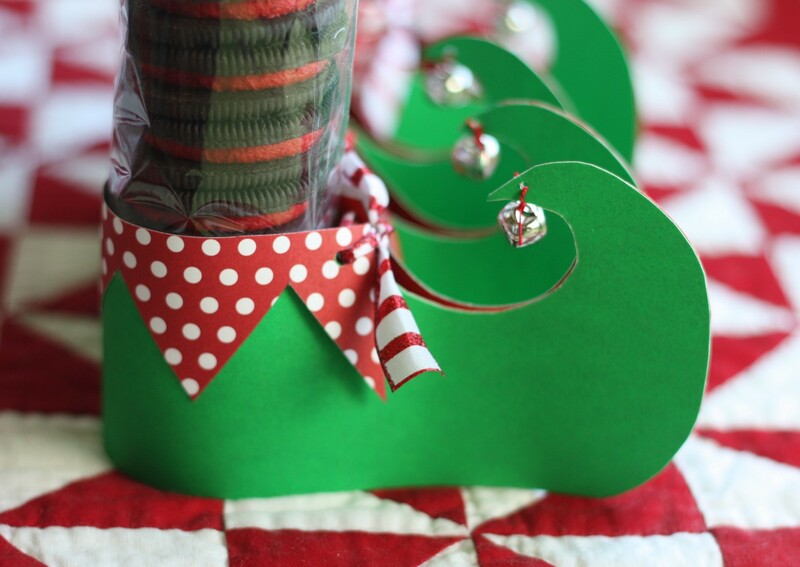 I think a lot of us will be copying your elf-y idea! Cute! We have red and green filled oreos here in Michigan! thanks! Aren't you two clever! Those are adorable -- thanks for the fun idea!!! Too cute! I didn't know about those Oreos. Have to keep an eye out. I had no idea Oreos came with red filling! I stay away from that aisle at the grocery store. This is a cute idea! those are great. 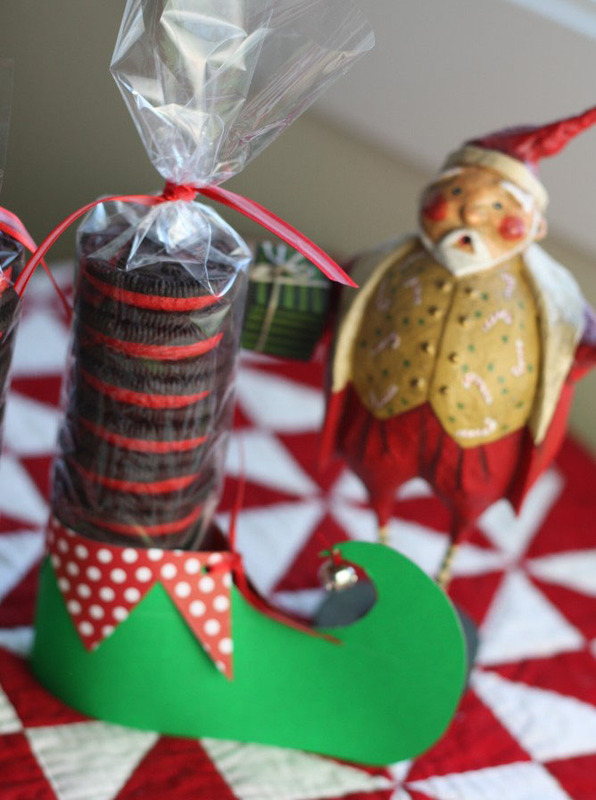 How do you keep from eating the oreos? OK - these are the cutest gifty jobby-doos I've seen this year! Thanks for the idea, gals! oops ... accidently commented as a "reply" .... :) still think they're awfully cute! How about the green mint oreos too??? 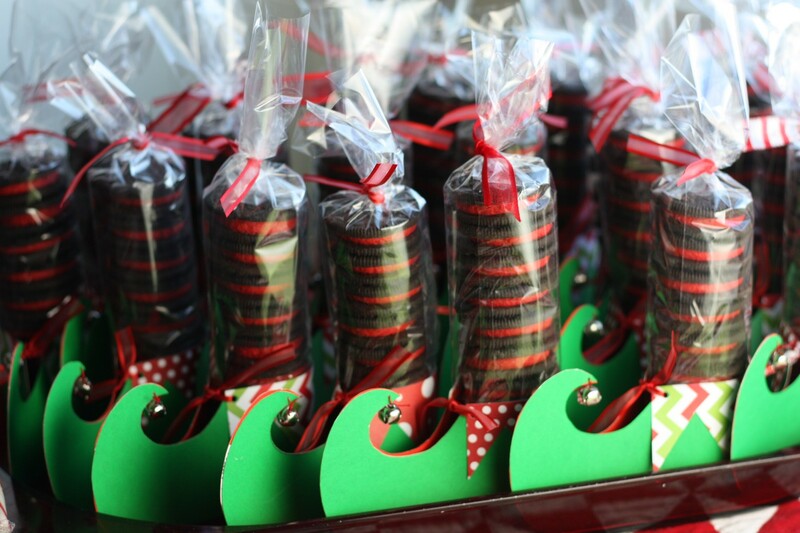 These are adorable and will make great favors. 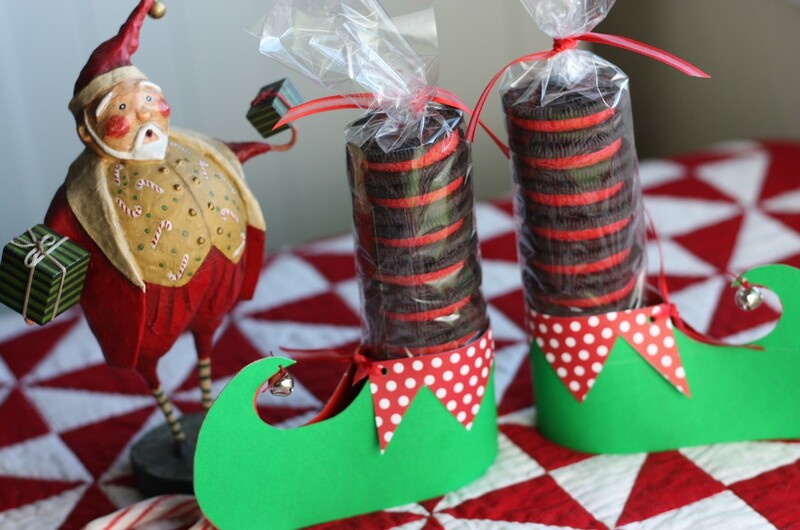 How do you keep the sleeve of cookies from falling out of the bottom of the shoe? Do you have any 'sole' on the shoe? Thanks so much! Love your blog! Did a little tutorial on making a similar treat. The cookies don't fall out the bottom, due to the tape holding them there. There's no sole. How clever ... Wish I was a neighbour!!! Do they have bottoms? Do they fall out? That's my question too! Will they fall out the bottom?? I love this idea. I am going to use it with the "You've been Elfed" for my neighbors. Too cute! ♥♥ always looking for quick ideas fir famiky-friends.. definitely! Cute!! Can you tell us what the total width of the template is for tip to tip? 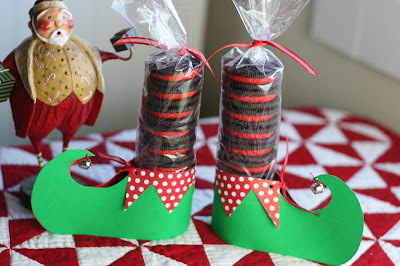 These are cute and I understand not wanting to give up template, but I am unsure of how big to make the shoe part to fit the cookies. This is the cutest idea! Thank you so much for sharing it with your readers. I have been searching the web for a template for the shoe, but no luck? I am crafty, but I really can't seem to draw this shoe. Would you please email at (dgallegos@mjwomack.com)when you get a minute? Maybe you can point me in the right direction. These are adorable! 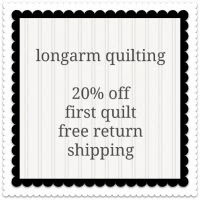 I pinned them and shared it on facebook! I am going to make them next year for my son's classroom! You can submit and share them on my website...I would love to feature them! so cute! how about the orange and black oreos in witches' boots for halloween? LOVE. How big are the shoes from end to end? The template is Very small!!!! 11.5" it fits across a piece of paper. Make sure your printer is doing 'actual size'. About how long do you think the cookies will stay fresh? I have a weeks vacation over Thanksgiving and would love to make these for all of my coworkers while I have time. Would the cookies be stale by Christmas? I think the cookies would be fine. I just opened an elf foot that I saved left over from last year, took a bite, you know, it wasn't that bad. Love the santa decoration in the picture, could you share where did you get it? The template link isn't working - any chance you could provide? Thanks! Thank you so much for providing a template! I plan to get the Oreos at Costco. Not as cute as the red ones but then I don't have to repackage them and will just put a gift bow on top.